I had difficulty falling asleep last night after hearing his message earlier in the evening. I was then wide awake at 5 am (borderline miracle), again thinking about Francis’ sermon and subsequently about the myriad of great sermons I have heard over the course of my life. I have had the pleasure of hearing hundreds of great sermons, and am thankful for how God has used a variety of individuals over the years to influence my thinking and my living in profound ways. Last night’s message got me thinking about those rare messages that get etched in your soul and forever transform the way you live. Four such messages stand out in my mind. Conspicuously absent is a reference to the sermon which led me to receive Christ in the first place. That message didn’t come from a pulpit, or even from within a church, but at a Christian camp (Muskoka Woods) nearly 30 years ago, a few godly young men shared the Gospel with me and my life has never been the same. The 4 messages noted below have also changed my life in some very serious ways. Preaching from Philippians 3, MacArthur had me diagnose the condition of my relationship with Christ in a way I had never done before. Until this message, I was content in delighting in my conversion—content in delighting that my status was “in Christ”. What I had not thought about yet was the destination of my faith. I had not thought about aiming my faith in any particular way. I was arrested by the apostle Paul’s example: “One thing I do: Forgetting what is behind and straining toward what is ahead, I press on toward the goal to win the prize for which God has called me heavenward in Christ Jesus” (Phil. 3:13, 14). MacArthur’s summary of that pursuit: “Christ-likeness”. Everything else, every other pursuit, is “rubbish” (“dung”) by comparison. (Phil. 3:8). I don’t often listen to sermons while sitting at my desk in my home office, but God had arranged in His sovereignty that I hear this particular message by Francis Chan. This message can still be heard online and though the message is somewhat long (an hour), I commend it to anyone looking for more intimacy with God through prayer. The section of the sermon that took a particular hold on me begins at the 34:00 mark, where Chan deals with the subject of unanswered prayer and unpacks Isaiah 58. What I can highlight from that text is the idea that God doesn’t listen to our prayers if we are doing particular things that are evil—or if we are failing to do certain things which are of great necessity. I was in my mid-20s and already an ordained minister when I heard this message. I had committed my life to “serving Jesus”. Christ had done so much for me, and now it was time for me to do some serious things for Him—so I thought. Skillfully connecting 3 New Testament Scriptures, Piper totally changed my perspective on how I was to function as a pastor. The first thing I needed to hear was that God doesn’t need me. That’s what the apostle Paul told a gathering in Athens, “(God) is not served by human hands, as if He needed anything, because He Himself gives all men life and breath and all things” (Acts 17:25). That text momentarily paralyzed me. Now what? Then came the 2nd text, from Mark 10:45, where Jesus announces to His disciples, “The Son of Man did not come to be served, but to serve, and to give His life as a ransom for many.” Piper’s translation: Let Jesus serve you. Not just when He saves you. Let Jesus serve you every day of your life. Those 2 texts nicely set up the 3rd from 1Peter 4:11: “Whoever serves, should do it with the strength God provides, so that in all things God may be praised through Jesus Christ.” Piper’s translation: Whoever does the work gets the credit/glory. Let Christ power your ministry so that Christ gets all the glory. One of my elders at the time, told me many years later, that my approach to ministry and my preaching dramatically changed when I got home from that conference. The supremacy of Christ in all things became the aim of every initiative and every ministry step. I’m still digesting, and processing, this sermon—just 12 hours after Francis delivered it, not far from my home in Nassau, Bahamas. 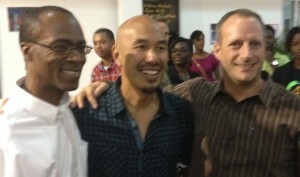 Since St. Andrew’s Kirk was one of the two congregations that organized this event, I had an opportunity to have close proximity to Francis Chan during his 2-day stay in Nassau. The crazy thing about what I will call “The best sermon I have ever heard” is that Francis wasn’t sure what he was going to speak on when he arrived in Nassau. He wasn’t even sure what he was going to speak on an hour before we started. He wasn’t even sure what he was going to say as he stepped forward to the podium! Francis showed us the various ways in which we try to establish heaven on earth, or a “happily ever after”, by investing too heavily in temporal things—i.e. having a certain kind of home, a certain kind of family life, a certain amount of wealth. Because we are uncertain about what heaven will be like, and about how good it will be, we hold back in our investment into things of eternal significance. As I examined myself, listening to Francis from just a few feet away, I was deeply convicted. I’ve been hedging my bets. I, too, am betting on God, but I haven’t pushed “all in”—not even close. I’m trying to have the best of both worlds. But contrary to what some might say in our day, we’re not supposed to have “(Our) Best Life Now”. Our best life might come “Soon and Very Soon”, but our best life is not our earthly life. Our soul won’t be satisfied until we see Christ face to face in glory. Intellectually, I’ve believed this for a very long time. Last night, Chan preached in such a way that my will and my desires were deeply affected. I want to push “all in”. I want St. Andrew’s Kirk to push “all in”.